At the time of this blog post, BitKinex 3 is available for free, and it contains a bunch of features that make it an appealing FTP and WebDAV client. Fig. 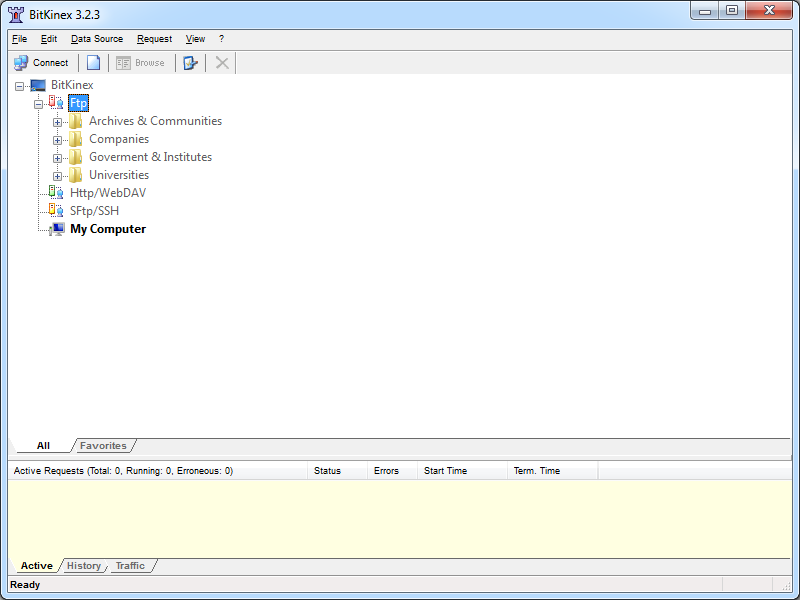 1 - The Help/About dialog in BitKinex 3. Fig. 2 - The main BitKinex 3 window. Creating an FTP data source is pretty straight-forward, and there are a fair number of options that you can specify. What's more, data sources can have individual options specified, or they can inherit from a parent note. Fig. 3 - Creating a new FTP data source. Fig. 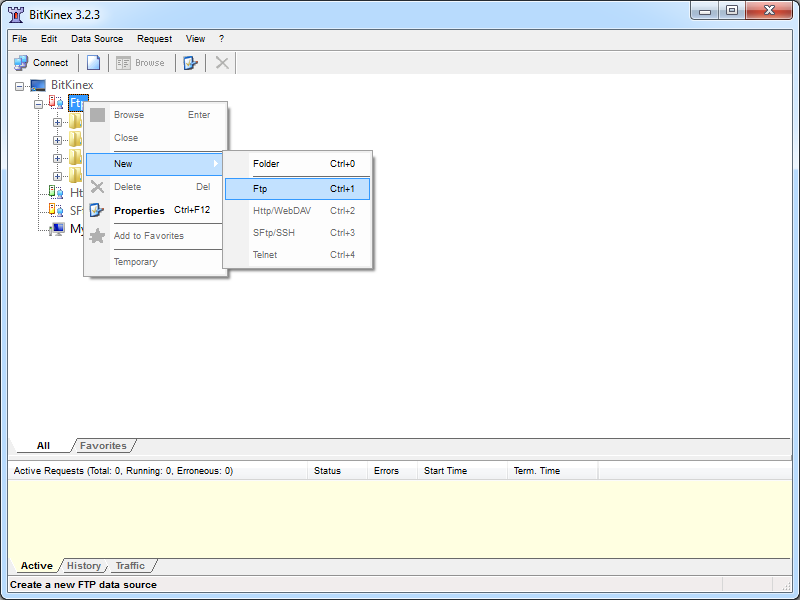 4 - Specifying the options for an FTP data source. Fig. 5 - An open FTP data source. That being said, the documentation is a bit sparse and there are few examples, so I didn't attempt anything ambitious from a command line during my testing. BitKinex 3 has built-in support for FTP over SSL (FTPS) supports both Explicit and Implicit FTPS. To specify the FTPS mode, you need to choose the correct mode from the Security drop-down menu for your FTP data source. Fig. 6 - Specifying the FTPS mode. 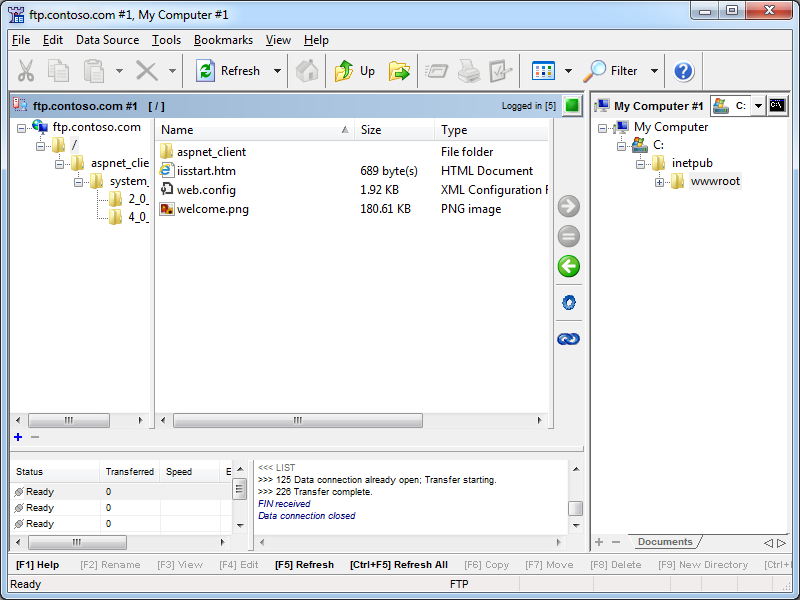 Once you have established an FTPS connection through BitKinex 3, the user experience is the same as it is for a standard FTP connection. True FTP hosts are not supported natively, and even though BitKinex 3 allows you to send a custom command after a data source has been opened, I could not find a way to send a custom command before sending user credentials, so true FTP hosts cannot be used. 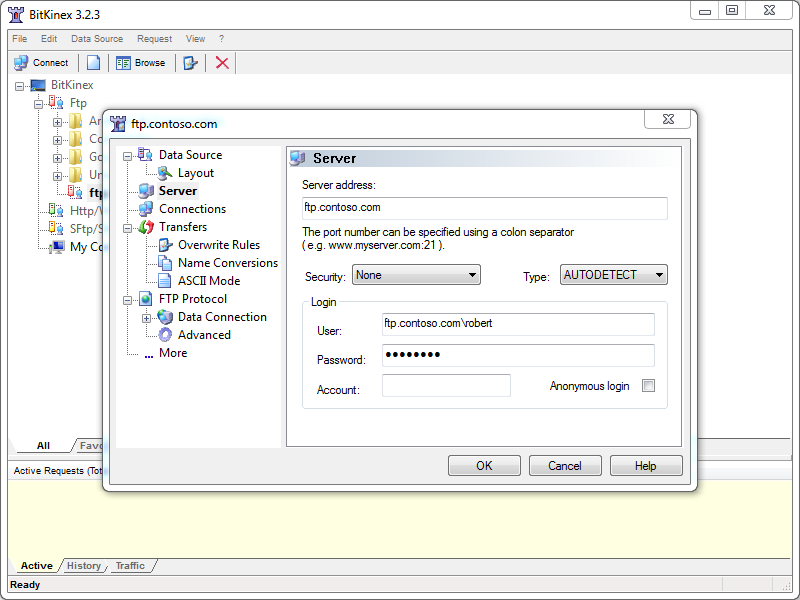 BitKinex 3's login settings allow you to specify the virtual host name as part of the user credentials by using syntax like "ftp.example.com|username" or "ftp.example.com\username", so you can use virtual FTP hosts with BitKinex 3. Fig. 7 - Specifying an FTP virtual host. mentioned earlier, it does support command-line automation. For this installment in my series about FTP clients, I want to take a look at Beyond Compare 3 from Scooter Software. At its heart, Beyond Compare is a file/folder comparison tool, so it might seem an unlikely candidate for an FTP client, but it has a lot of great FTP features packed into it. Fig. 1 - The Help/About dialog in Beyond Compare 3. Note: For this blog I used Beyond Compare version 3.3.5. Like many self-proclaimed computer geeks, over the years I have collected a lot of various utilities that perform specific actions that I need to take care of. Sometimes I discover these tools when Binging my way through the Internet, and other times they come highly recommended from other people. In this specific situation, Beyond Compare falls into the latter category - dozens of people had recommended Beyond Compare to me before I tried it out, and after falling in love with it I have recommended it to dozens of my friends. At the time I was using Microsoft WinDiff to compare files, which is still a great application to do simple comparisons, but Beyond Compare does so much more. Fig. 2 - The Start New Session screen. Fig. 3 - Comparing the files within two folders. Fig. 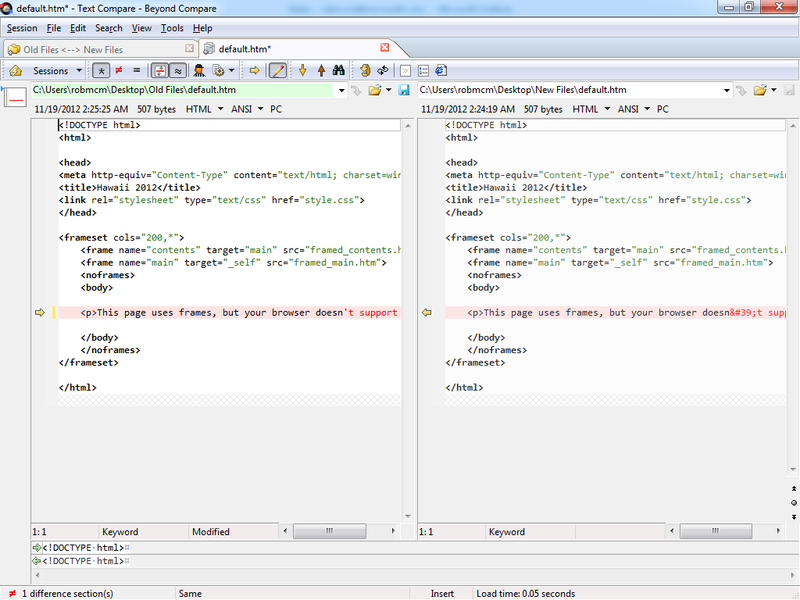 4 - Comparing the HTML content of two files. I could go on about Beyond Compare as a comparison tool, but that's really outside the scope of this blog since I am supposed to be talking about FTP features. Needless to say, if you're looking for a good comparison tool, you might want to download the trial edition of Beyond Compare 3 and give it a try. That being said, let's get back to the business at hand. Beyond Compare 3 has a collection of FTP Profiles, which you can think of as analogous to a site manager in more traditional FTP clients. Fig. 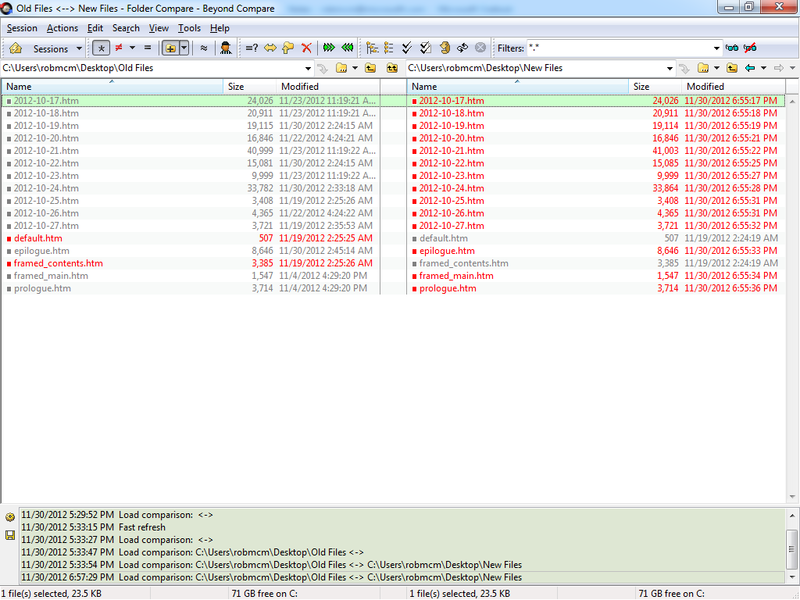 5 - Opening Beyond Compare 3's FTP Profiles. 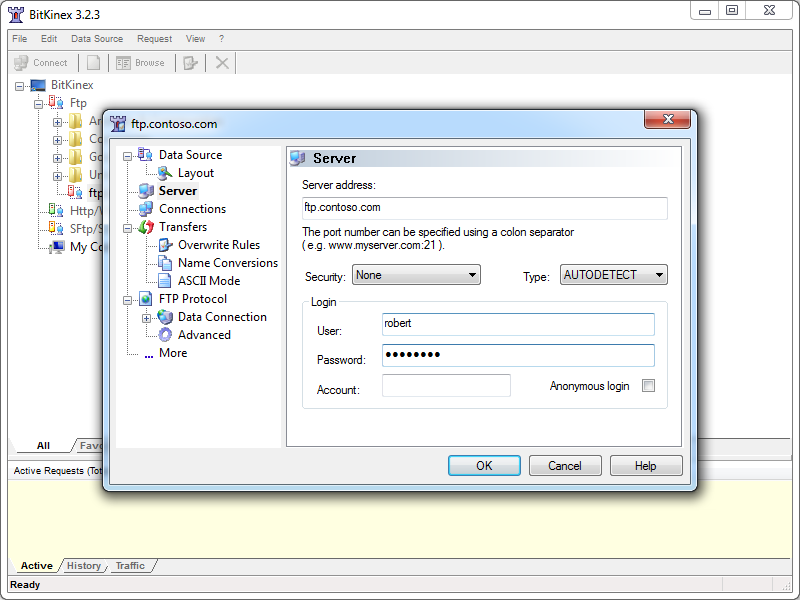 Inside the FTP Profiles dialog, you can specify a wealth of connection options for remote FTP sites that you would expect to find in any other FTP client. Fig. 6 - Specifying FTP connection options. Once you have established an FTP connection through Beyond Compare 3, you can view your local files and the files in your remote FTP site side-by-side, and then you can perform comparisons, updates, merges, etc. Fig. 7 - Viewing local and remote files. Beyond Compare 3 has built-in support for Explicit FTP over SSL (FTPS), which you specify when you are creating the FTP profile for a site. Fig. 8 - Specifying an Explicit FTPS connection. 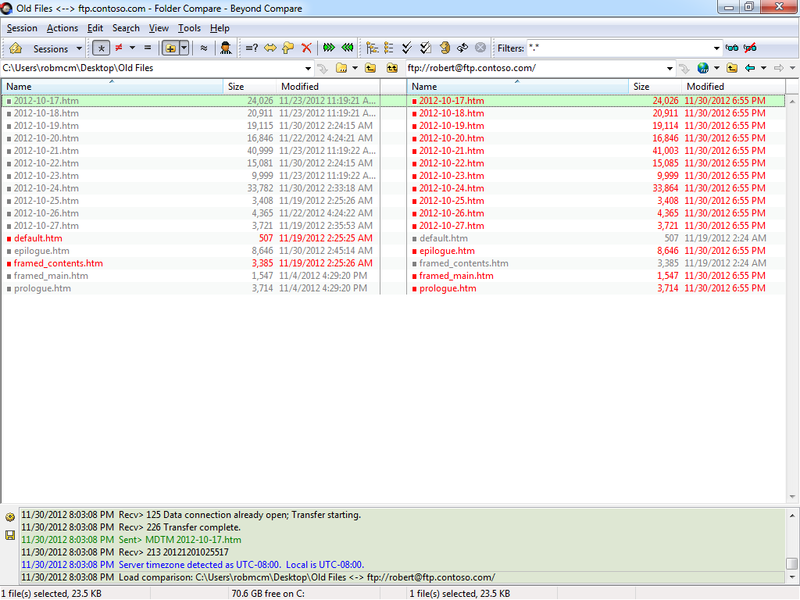 Once you have established an Explicit FTPS connection through Beyond Compare 3, the user experience is the same as it is for a standard FTP connection. Fig. 9 - Comparing files over FTPS. 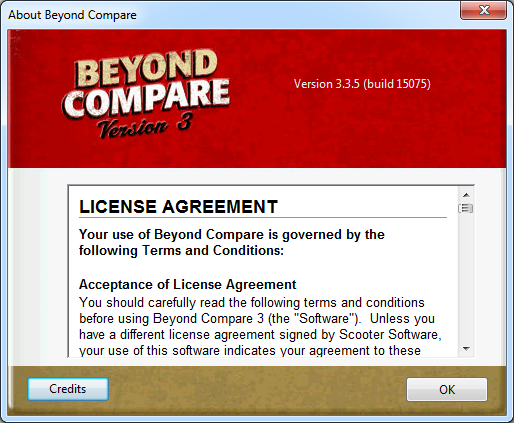 10 January 2013 Update: I heard from Craig Peterson at Scooter Software that Beyond Compare 3 does support Implicit FTPS, but it does so implicitly. (No pun intended. ;-]) When you connect using FTP over SSL on port 990, it will automatically use implicit FTPS. 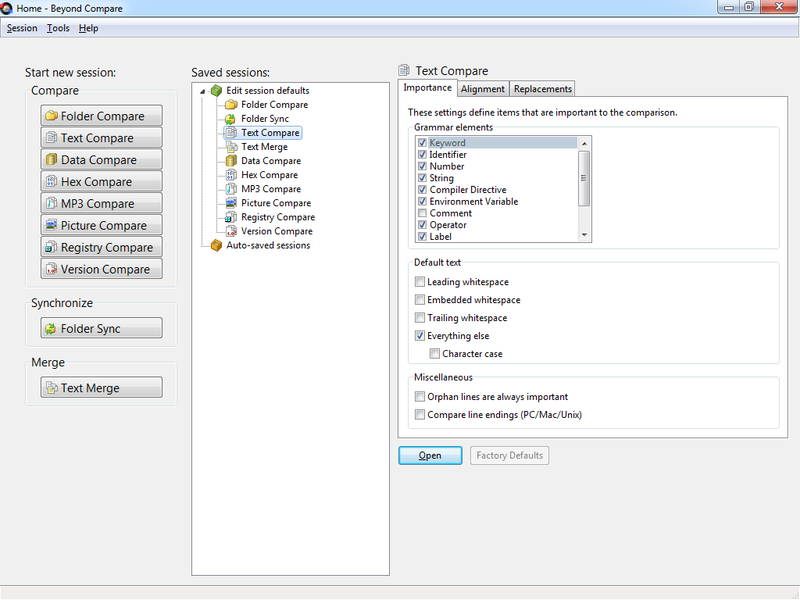 Beyond Compare 3 has built-in support for the HOST command, so you can use true FTP host names when using Beyond Compare 3 to connect to FTP7 and FTP8 sites that are configured with host names. This feature is enabled by default, but if you needed to disable it for some reason, that feature can be accessed on the Connection tab of Beyond Compare 3's FTP Profiles dialog. Fig. 10 - Specifying support for the FTP HOST command. 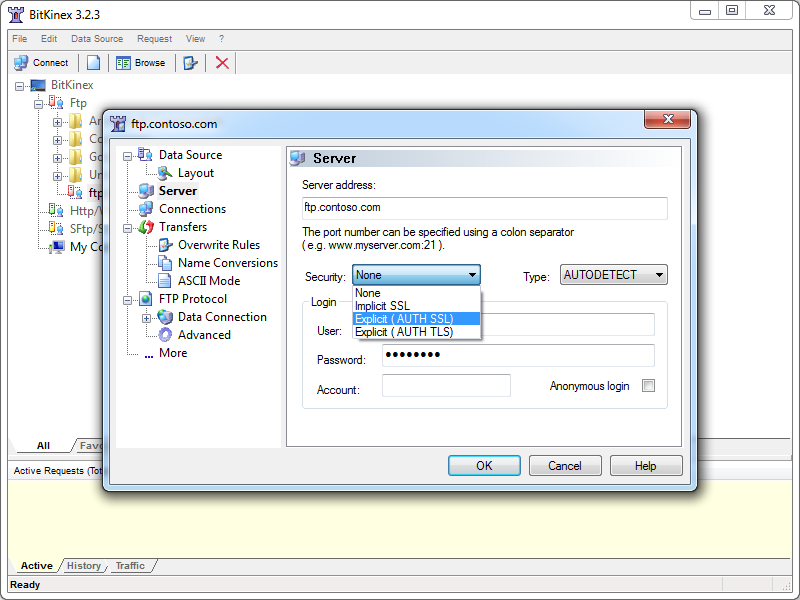 Beyond Compare 3's login settings allow you to specify the virtual host name as part of the user credentials by using syntax like "ftp.example.com|username" or "ftp.example.com\username", but since Beyond Compare 3 allows you to use true FTP hosts this is really a moot point. Just the same, there's nothing to stop you from disabling the HOST command for a connection and specifying an FTP virtual host as part of your username, although I'm not sure why you would want to do that. Fig. 11 - Specifying a virtual FTP host. As noted earlier, Beyond Compare 3 supports the FTP HOST command, and is enabled by default for new connections. 1 Note: I could not find anyway to extend the functionality of Beyond Compare 3, but it does have a scripting interface; see their Automating with Scripts and Scripting Reference pages for more details.